Today we’re taking a look at the ten most productive cornerbacks from the 2018 regular season by looking at the passer rating they allowed in coverage. This is by no means a list of who the “top corners” were from a season ago, in fact, you’d be much better off looking at PFF coverage grades to paint that picture as passer rating doesn’t discriminate between an incompletion that was caused by the cornerback vs. an incompletion that was created by an off-target throw by a quarterback. This list is simply a final look at which cornerbacks yielded the lowest passer ratings throughout the regular season. Gilmore was one of just four cornerbacks in 2018 to log at least 600 snaps in coverage while holding opposing quarterbacks to a passer rating of 80.0 or lower. The veteran Patriot ranked sixth among cornerbacks this past season by surrendering just 0.72 yards per coverage snap, and he was one of only three corners to play at least 600 coverage snaps this past season while allowing fewer than 100 total yards after the catch. No rookie cornerback was challenged more than Ward in 2018 and the fourth overall pick answered the call. The former Ohio State star allowed 44 catches on 82 targets for 451 yards and four touchdowns to go with three interceptions. Ward ranked seventh among qualified corners this past season with an 83.6 coverage grade, and he was one of just 13 cornerbacks to allow less than 1.00 yards per coverage snap while playing at least 500 snaps in coverage. Don’t tell Brandon Carr that age is anything more than just a number; the veteran cornerback is the only player over the age of 30 to make this list. Carr surrendered 43 catches on 78 targets in 2018 for a total of 607 yards and zero touchdowns to go with two interceptions. Carr tied for eighth among cornerbacks by forcing 15 incompletions, and he was one of just three corners to register at least 500 snaps in coverage and not surrender a single touchdown. Fitzpatrick is the second rookie to make this list, but he’s the first player to make it who didn’t primarily play outside corner in 2018. The Dolphins had Minkah line up all over the field this past season; he spent 379 snaps as a slot corner, 281 snaps out wide and another 261 snaps as either a free or box safety. In coverage, Minkah was especially effective out of the slot, where he ranked first among cornerbacks by allowing just a 53.4 passer rating. Hill’s playing time was sporadic throughout the season, but when it was all said and done the rookie out of Texas allowed just 16 catches on 31 targets for a total of 183 yards and a touchdown to go with one interception. 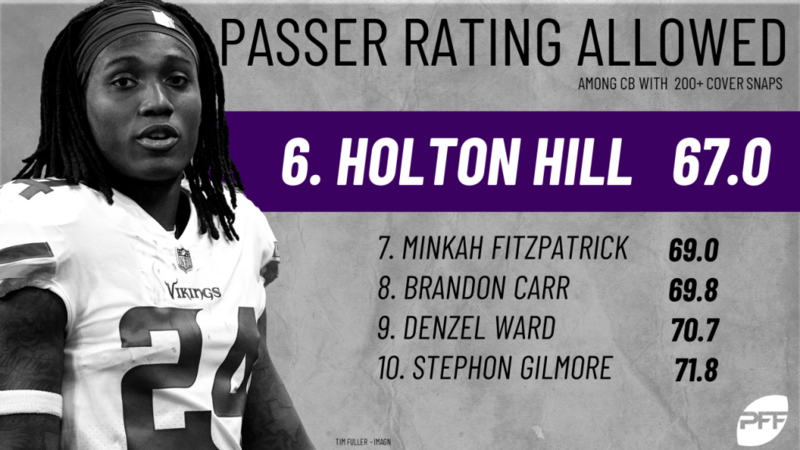 On a per-snap basis, Hill was one of the best cornerbacks in the league in 2018 when it came to disrupting the catch point; he ranked second among all qualified cornerbacks with a 25.8 forced incompletion percentage. It shouldn’t come as a surprise that the NFL’s interception leader (well, he tied for the lead) landed a spot on this list. Fuller was the third-most targeted cornerback in 2018, seeing 105 targets into his coverage; he allowed 63 of those to be caught for a total of 745 yards and four touchdowns to go with his seven interceptions (and he dropped an eighth in Week 1 against the Green Bay Packers).